Are you teaching teenage students who need to learn general English to prepare for real life and as well also perhaps prepare for Cambridge English exams? We’ll be looking at how Cambridge English Prepare flexibly achieves both these goals by its lexical-grammatical approach which uses research from English Profile and the Cambridge Learner Corpus while also giving teachers control over their students’ gradual exposure to exam preparation. Whether preparing for real-life with cross-curricular and culture units or for real exam practice with Cambridge English Testbank and ‘Prepare to’ sections for the productive skills of speaking and writing, Prepare prepares. Empowering you and your learners—and your school! Gary Anderson was Pedagogical Director of the language program of the former American Center in Paris where he taught and co-ordinated classes for all ages of learners. 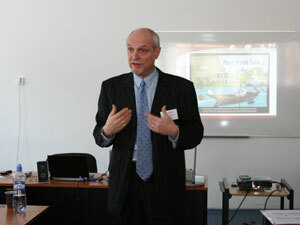 He was President-elect of TESOL France when he joined Cambridge University Press as International Teacher Trainer. He has since given talks in over 60 countries on five continents, including several times Slovakia and the Czech Republic. He writes a blog On the Road with Gary: Trips and Tips at www.cambridge.org/elt/blog. or contact Lucie Kočandrlova at lucie.kocandrlova@eufrat.cz, 724745645. There is no registration fee, the seminar is held for FREE. You can also attend only one of the talks according to your choice.